Location: 900 Ohio Dr. SW, Washington, D.C. 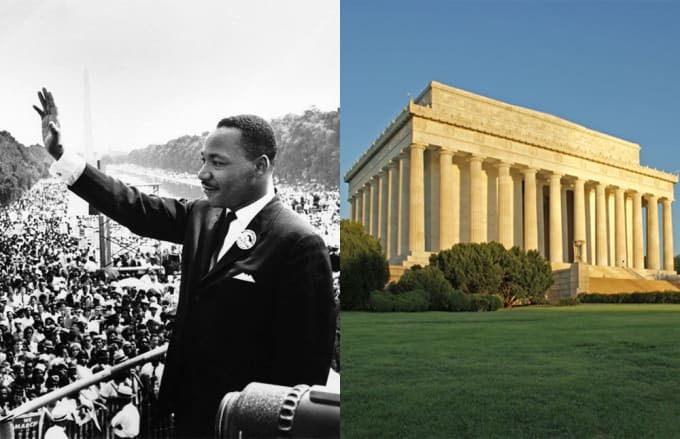 The Lincoln Memorial was the site of Dr. Martin Luther King, Jr.'s landmark "I Have a Dream" speech. On August 28th, 1963, over 200,000 civil rights supporters descended on the nation's capital to hear Dr. King deliver the defining speech of the Civil Rights Movement. Towards the end of the 17-minute speech, after gospel singer Mahalia Jackson shouted, "Tell them about the dream, Martin!" from the crowd, Dr. King abandoned his prepared words and started preaching. The speech, which incorporates elements of the Bible, the Emancipation Proclamation, the Declaration of Independence, and United States Constitution forced President Kennedy to address civil rights legislation in congress. In 2003, the National Park Service placed an inscribed pedestal at the Lincoln Memorial to commemorate the 40th anniversary of Dr. King's speech. The following year, the Library of Congress added the speech to the United States National Recording Registry. The Lincoln Memorial is located on the National Mall in Washington, D.C. Considered a sacred space, it is part of the Registry of National Historic Places. It can also be seen on the back of a $5 bill, while Lincoln's face can be found on the front.